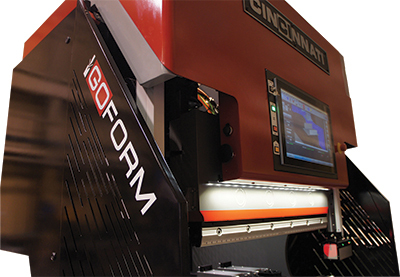 Cincinnati uses the FABTECH stage to debut its CL-960 fiber laser, Maxform high-speed hydraulic press brake and the recently introduced Goform electric press brake. The CL-960 laser boasts a 6000-W laser, and provides air-assist cutting technology to further reduce production costs. The Goform 40-ton portable electric press brake offers six-axis backgauging. It s system is equipped with the same HMI control standard on other CI press-brake models. Also on display: A replica of the Orion spacecraft showcasing CI’s BAAM (Big Area Additive Manufacturing) 3D-printing capabilities.